Our Bodacious Dog Mom Life: Random Rant: Never Forget Where You Started. Your Roots Keep You Grounded. Flo had been donating fresh-baked cookies to the shelters for a little over 3 years. It's what she did to occupy her time while her husband was on the road. He was a truck driver. Their only child had grown and moved out to start his own life. Although Flo had a slew of friends, enjoyed Friday night Bingo and had an active social life, baking homemade cookies for the shelters and soup kitchens was something she enjoyed doing. And let me tell you, Flo could bake. Her cookies and other baked goods were incredible. One afternoon, while sipping coffee at Flo's kitchen table, she shared some good news with me. Someone at an event she recently attended had fallen head over heels for her cookies. There was excitement in her voice. Long story short, that someone had a friend who owned a cafe and they were certain Flo's cookies would be a welcomed addition. They were. Over the next few months, word traveled about Flo's cookies. People started requesting platters. Another small eatery was interested in purchasing an assortment of Flo's baked goods. Flo was in her glory! She loved to bake, the community was buzzing about Flo's cookies and treats, and her pockets jingled with extra change. She was baking 7 days a week. I was genuinely happy for Flo. She was doing what she loved to do and making a little extra money. About six months after her newfound stardom, I visited Flo. She was experimenting with cookie sandwiches and had requested my presence as a taste tester. Flo didn't have to ask me twice. While sitting at the table waiting for the first batch of sugary goodness, I noticed the baskets she filled for the soup kitchens and homeless shelters were no longer stacked on the table. Her lists of soup kitchen locations and their hours of operation that once hung on the bulletin board was gone. "Hey Flo, you still donating your cookies to the shelters and kitchens?" "I haven't done that in a few months. There's no time. I'm baking all morning and afternoon most days of the week. My stuff is selling out. Not enough hours in the day..."
"What about the people at the homeless shelters and soup kitchens who enjoyed your cookies? That was such a treat for them." "I just don't have the time anymore." For those expecting a continuation of Flo's story...well, there isn't one. Flo's story stops here. No, she didn't die or suffer a personal injury halting her flourishing baking career. That day, I cut our visit short. I didn't sample her sandwich cookies. In fact, I didn't visit Flo again and kept our verbal exchanges short and sweet. Did I harbor envy because of her instant success? No. My reasons for putting distance between us and discontinuing my support had nothing to do with envy. It had everything to do with, "I just don't have the time..."
Since Flo, I've witnessed this shift in efforts and attitude countless times. It happens quite a bit in my profession. And, more than once, I've been on the receiving end. I've always had an aversion towards people who start something (business, charity, non-profit, etc) with passion, heart and soul and an appreciation for those supporting their mission, and down the road, their ego inflates. As their success builds, the demand increases and the money starts pouring in, they begin to acquire certain unfavorable qualities. They let go, push aside and/or forget those who supported them from day one and contributed to their success. They no longer have time for the "insignificant" small stuff that once mattered and was important to them and others. They lose sight of the passion, heart, and soul that once fueled their fire. They allow money to become the primary focus and what now fuels their fire. They bask in the spotlight of fame and popularity. They become selective about who's in their circle, who they're seen with and who they associate with. They white-knuckle any opportunity to be acknowledged by or have their photo taken with those who teeter on, or have become celebrity status. I'm not saying this happens to everyone. I've seen a scattered few who keep themselves in check. They embrace success while remaining humble and grateful. They've never forgotten faces or were too busy to contribute to the greater good. Those humans are far and few between. In the past almost 4 years, I've seen the rise of several groups and businesses. While I applaud the fundamental work ethic behind success, as I know this all too well, I find myself disgusted by the shifts in their demeanor. These are people, groups, and businesses I have been around since their endeavor was just merely an idea. Some, I've assisted. Some, I've worked for. Some, we've donated our time and biscuits too. Other's I've helped launch through social media, blogging, networking, etc. In the here and now, with most, I've been "put on the back burner". They no longer engage, correspond or support our efforts and mission. Or, they've moved on to bigger and better things. Up the ladder. Up. Up. Up. I'm not the only one they've left behind or look down upon. Sadly, they've lost sight of what had once been their foundation, support system, and fan club. Their community. The word community, to them, now translates to...wait for it...stepping stones. The people amid their ever-changing communities are a dime a dozen. Easily replaceable. No, this isn't a pity trip. It's more of an observation. As many times as people have complimented us on "keeping it real" and not veering off the path of simplicity (biscuits, packaging, mission), we've had just as many humans suggest we launch a business, open up shop, expand, offer fancier biscuits, etc. While we appreciate the thought, that's not something we're interested in doing. One example, to shed a better understanding as to why, would be the last couple of Summers including this one. We received quite a few emails to participate in non-pet themed events or events that had nothing to do with raising money to help our local animals in need. While some of these events were quite extraordinary, and our meager Bodacious Biscuit Love funds would have bulked up a bit, we declined. A few people came forth and asked, "Why would you waste your time with a diddly shelter event when you could be at this kickass event with lots of people and publicity? Don't you want to make money?" 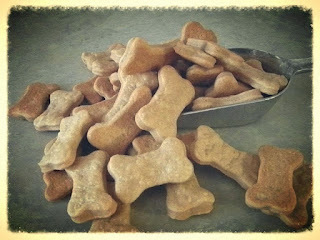 Others questioned our decision to share our Bodacious Biscuit Love Peanut Butter Dog Treat recipe. People were generally shocked. "Do you know how many people won't be ordering biscuits from you because they have the recipe now?" Yes, we were aware, but our priority was making sure that all Dog Parents had access to our original, and other, recipes so they could make healthy, inexpensive homemade dog treats at home. Of course, we want to make money. I can count on one hand how many weeks, in the past almost 4 years, when we've had enough Bodacious Funds to purchase ingredients, supplies and cover shipping costs for the week ahead. Most weeks, we dig into our pockets to compensate for what our funds don't cover. At times, we scrape. We support our local shelters. We support pet parents in need. We donate a lot of biscuit love to shelters and to pet parents who have fallen on hard times. Regardless of how many times we've been left in the dust or read the comments suggesting we go bigger or create fancy biscuits, our feet will always remain on the ground we started on. Our mission is etched in granite. There are no ladders to climb. We will never stray from our Bodacious Community...a community we're proud and honored to be a part of. This is a team effort. There are quite a few "Flo's" in the world. I witness their gradual shift every single day...mostly on my news feed or other social media streams. The rise up the corporate ladder. Fame. Fortune. Bloated fan clubs. At times, I reflect back to a year or two ago when they first started their endeavor. Oh, how they've changed. I see through the smoke and mirrors. I wonder if they forget those, including myself, who knew them before they made it big and how ridiculous their facade appears to us in the here and now. I sit back and shake my head. With any rise, there is usually a fall. I've witnessed this as well. While I don't wish failure or the crumbling of an enterprise on anyone, the fall off of a high horse or a tumble down the corporate ladder can be a lesson learned. I've been told it's a humbling experience. A reality check. A wake-up call. As the saying goes, "No matter how big your house is, how recent your car is, or how big your bank account is, our graves will always be the same size. Stay humble."